Hello everybody, for today a silver mani. I'm really loving this edgy mani, I like the grungy look to it. I used Millenium for the stripes and the background color is a dark silver foil from Hema, a local store. This is another tape mani and it was supposed to be a regular triangle mani like I did before. But as I was taping my first hand in the usual, same pattern, I thought it would look cooler if I just placed the tape randomly on the nails. The result is visible on my right hand in the picture below. I like it a lot more than my left, it's more dynamic, not so predictable. 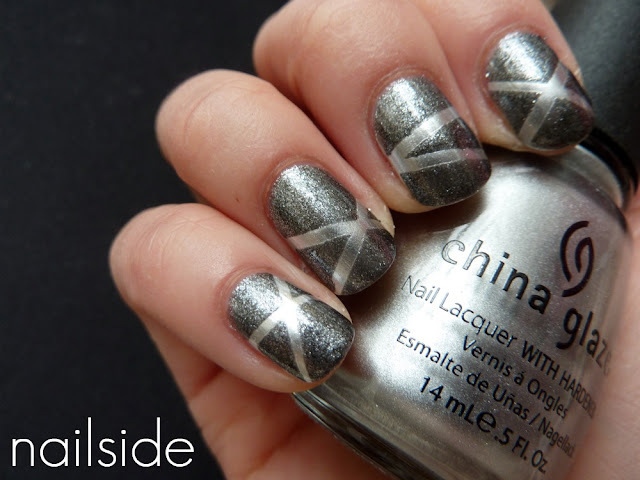 Do you like this rockin' mani as much as I do?